Situated on the corner of Lindbergh Road and Airport Boulevard, in the very heart of the Town, the park forms the only real common area in the Town. It is envisaged as a place of quiet thought and contemplation; a need to provide a sheltered and welcoming location for existing and proposed memorials and the aviation heritage of Gander. The main entrance is located off Airport Boulevard but will also be accessed from the “runway walkways” from Lindbergh Road. At the apex of the runways and elsewhere are the memorials to those who have given their lives in the defense of others. The cenotaph area and walkways are lined with two-toned concrete paving stones. The size of the area is favourable to accommodating military ceremonies. A lifesize monument of a “sitting” Sergeant Gander accompanied by his “standing” soldier handler is positioned to the left of the cenotaph. 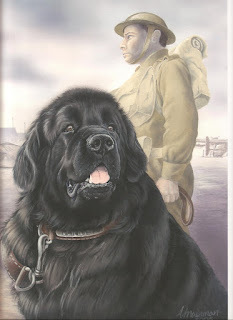 They are portrayed as being on alert, vigilant and in a sentinel position for the cenotaph. An additional long, low granite wall will be positioned within the park to commemorate many of Gander’s aviation disasters and historical events, The Wall will bear inscriptions of past military conflicts and air disasters in Gander. In addition, the Airmen’s Memorial Wall to the 125th Newfoundland Squadron of the Royal Air Force will be positioned to the left of the cenotaph at the south end of the site. This monument is approximately 10’ high at its center and 20’ in width. This monument was formally located at the North Atlantic Aviation Museum. The walkways are designed to replicate the present airport runways in that they are close to their approximate positioning. Storyboards will identify and chronicle each memorial. Great consideration has been given to the retention of present foliage and trees. Plantings would focus on low maintenance and hardy species that are visually pleasing and contribute to the context of the Park. Park benches, lighting, flora will help in making the site appealing to the general public as a place of quiet solitude and calm. Walkways are positioned in the direction of the present airport runways. They extend so that all areas of the park are accessible to all monuments and storyboards. The cenataph area and walkways will be constructed of two toned concrete paving stones. The proposed Gander Heritage Memorial Park is a project of former students who attended a school reunion in Gander in 2010. Prompted by the need to leave some type of lasting legacy in the Town, it was decided that the Reunion’s Organizing Committee would transfer its focus to seek a suitable project that would be of a permanent nature and be available for public viewing as well as contributing to the wartime history of Gander’s unique part in that effort. The erection of a statue of the Newfoundland war dog, “Sergeant Gander” and his contribution to the defense of Hong Kong Island in 1941 was determined to be an appropriate and fitting project that would be attractive to today’s children as well as representing a gift from the early children of Gander. 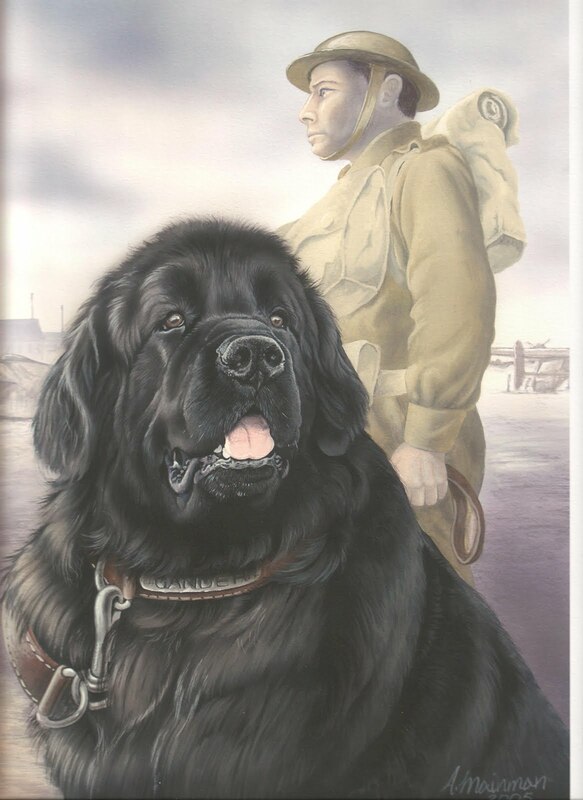 The statue would be positioned at the present cenotaph site and would be a life-size monument of the dog sitting with his soldier handler. It was soon determined, however, that the present site was in need of major renovation and restoration. In order to accomplish any renewal of the area, the Committee realized that a transformation needed to take place. A landscape architect was engaged to plan and design a new concept that would not only encompass the cenotaph but would also be attractive to residents and visitors as a place of retreat and reflection. The “park” would also include other monuments, tributes, etc. relating to Gander’s role in aviation history. The cost will be in the range of $250 to $350 thousand dollars and fund raising will hopefully come from provincial and federal programs, organizations within the Town and through public contribution. It is anticipated that site preparation may start as soon as the summer of 2012.